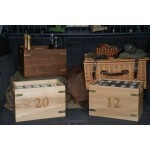 Our range of 'Field & Cartridge Boxes' are a stylish and practical way to transport all your field accessories. Our handmade solid oak and ash ‘Field Boxes’ are a stylish and practical way to transp..
Our handmade 'Cartridge Boxes’ are a stylish and practical way to store and transport ..
Our handmade ash ‘SLOGASM’ box is very popular and certainly make a statement. A..